I love the hot stove league. In the days leading up to the NBA trade deadline last week, I was hitting refresh on my browser about every five minutes to find out the latest on rumored deals. There's just something about watching how teams jockey to position themselves for the stretch run, or begin the torturous process of rebuilding, that I find fascinating. Unfortunately for college sports fans, they miss out on all the wheeling and dealing. And hamstrung college coaches can't get their versions of Antawn Jamison or Tracy McGrady to shore up their rosters. Imagine if college football allowed trading, though. Heading into the upcoming season, who would be the buyers? Who would be the sellers? Who'd be on the move? Would programs look to make mega-deals or just tinker at the margins? Here are seven hypothetical deals that would shake up college football in 2010. 1. 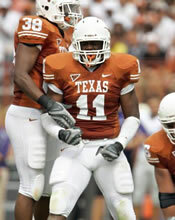 Texas sends Mike Davis, Tre Newton and Keenan Robinson to Alabama in exchange for Mark Ingram. Might as well start off with a blockbuster between the participants in last season's national title game. The defending national champions trading their Heisman Trophy winner in the offseason is akin to the Los Angeles Lakers dealing Kobe Bryant on the heels of a title. In other words, not happening. However, after assessing these two powers' strengths and weaknesses, this proposal doesn't seem so far-fetched. In Ingram, the Longhorns would gain the kind of workhorse running back that they've been missing for so long. Finding a major threat in the backfield is even more important for Mack Brown this season with Colt McCoy off to the NFL. Losing Ingram would definitely sting for the Tide. However, talented runner Trent Richardson proved last year that he's ready to be the man. Newton, probably Texas' best running back, could step in and play the part of the change-up runner, as 'Bama clearly prefers a rotation. Meanwhile, Alabama also gains a linebacker in Robinson who could start immediately for its depleted unit. Additionally, with Julio Jones looking at the distinct possibility of jumping up to the NFL at the end of the year, the heralded recruit Davis could prepare to take over next season. 2. Ohio State trades Nathan Williams to Texas A&M in exchange for Jeff Fuller. This deal wouldn't grab many headlines. Similar to adding a left-handed reliever before the playoffs, though, these kinds of moves enable teams to add that one missing piece. The Buckeyes are preparing themselves for a potential national title run. On offense, Jim Tressel's team could probably use a little extra element of explosiveness. Featuring one of the strongest offenses in the country, Texas A&M has the look of a dark horse in the Big 12. The Aggies need to show some serious improvement on defense if they want to make a serious charge, though. These two teams make pretty strong trading partners. A&M is loaded with talent at wide receiver. OSU has plenty of well-schooled defenders to offer. Fuller for Williams appears to be a win-win. 3. Penn State sends Mike Hull and DeOn'tae Pannell to Rutgers for the rights to Greg Schiano after 2010. The question driving this deal for Penn State: Why delay the inevitable? When it's big news that your head coach is actually going to be on the field, the time has come to make a change. Rumors have swirled around Schiano and Penn State for the last few years, and turning the program over to Rutgers' head coach should assure JoePa his team will be left in good hands. Meanwhile, Schiano can give the Scarlet Knights a nice parting gift: a Big East title. He has assembled a nice collection of talent in Piscataway, and nabbing two of the Nittany Lions' best prospects could be enough to put Rutgers over the top. 4. Oklahoma trades Jermie Calhoun and Mossis Madu to Ole Miss in exchange for Jerrell Powe. The Sooners took two major hits to the defensive line at the end of last season. Besides seeing superstar Gerald McCoy off to the NFL, his partner at defensive tackle, Adrian Taylor, sustained a gruesome leg injury in OU's Sun Bowl win against Stanford. He's rehabbing now, but Taylor could be on the shelf for all of the upcoming season. Even if he does play, he may struggle to regain his pre-injury form. Powe could team with promising youngster JaMarkus McFarland in Norman and OU's defense wouldn't miss a beat. So, why would Houston Nutt give up a potential first-round draft pick? Ole Miss clearly falls into the seller category this year. For the Rebels, last season was one of those years when you have to go for it. It didn't work out, and now Nutt should start building for the future. Calhoun was a touted running back recruit who has been caught up in the numbers game at OU. As a redshirt sophomore, he may be ready to blossom. Additionally, he was a spread quarterback in high school, making him a potential wildcat option for Nutt. Likewise, Madu could fill in as a stopgap replacement for Dexter McCluster as a slot receiver and running back. 5. USC trades Mitch Mustain to Tennessee in exchange for Gerald Jones. Unfortunately for Mustain, his Southern California ship has sailed. If he still harbors dreams of playing in the NFL, another year on the Trojans' bench probably won't help. The guy who will actually be playing quarterback for USC, Matt Barkley, has lost two of his best weapons with Damian Williams and Anthony McCoy off to the pros. 'SC has plenty of young talent, but it needs a seasoned presence like Jones at receiver if it wants to reclaim the Pac-10. With Jonathan Crompton's career in Knoxville having mercifully come to a close, new coach Derek Dooley is looking for a quarterback. He could throw a youngster into the mix and let him take his lumps. However, playing Mustain for a year would give the Vols a better opportunity to generate some momentum in Dooley's debut season. At the same time, incoming freshman Tyler Bray could play second string and learn the ropes for a year. Granted, Lane Kiffin did his best to completely poison his relationship with Rocky Top. Business is business, though, and it's tough to see UT turning down an offer at the right price. At the very least, the negotiations would be fun to watch. 6. Oklahoma State trades Markelle Martin and Richetti Jones to Notre Dame in exchange for Tate Nichols, Shaquelle Evans and Cierre Wood. Both these teams have the look of programs in the rebuilding phase. This is that kind of transaction. Rising juniors Markelle Martin and Richetti Jones still have two years left to play, and the two could contribute for the Irish's lackluster defense. The Cowboys, on the other hand, could stand a little talent infusion on the offensive side of the ball. RB Keith Toston has graduated and oft-injured running mate Kendall Hunter is done after 2010. Talented WR Dez Bryant is gone. Four starting offensive linemen used up their eligibility last season. The prospects coming over from South Bend could definitely step in for the departed personnel. 7. Nebraska trades Jared Crick to LSU in exchange for Russell Shepard. Everyone knows about the Mad Hatter's penchant for gambling. Maybe he passed off some of that bravado to his former defensive coordinator Bo Pelini, because this move would require some serious cojones. In Crick, the Cornhuskers have one of the best defensive tackles in college football. He makes for a pretty sweet cornerstone for the Pelini brothers' D. You don't take the notion of trading a guy like that lightly. NU wants to compete for a national championship, though, and Zac Lee won't get Big Red there. Thus, acquiring a new quarterback becomes paramount. Shepard would be a home run. Why would Miles want to trade a talent like Shepard? Well, even with a national championship to his credit, his seat is growing increasingly warmer in Baton Rouge. Les the Ripper needs to win now. Getting Crick is a win-now move. After finishing 2009 ranked 95th in the country in sacks per game at 1.54, the Bayou Bengals desperately need a pass rusher. Crick absolutely fits the bill. With Jordan Jefferson the likely starter at quarterback for the next two seasons and stud recruit Zach Lee now on the roster, it would be in character for Miles to roll the dice. The Pelinis have shown an ability to develop top-notch defensive prospects. They should feel confident that they could coach up someone to soften the blow of losing Crick.